Located in the heart of Cardiff, you are minutes walk away from all the enjoyment that city centre living gives. Cardiff is a shoppers paradise. Queen Street and St Mary Street are where the major high street stores are located.Marks and Spencer, Boots, River Island, Next, Dixons can be found on these streets or in Shopping Centres here. For the more exotic shopping experience, wander through what Cardiff is famous for, the Victorian shopping arcade. 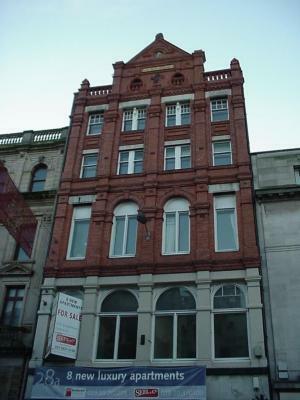 Castle Arcade and Duke Street Arcade are a stone throw away. Window shop to your hearts content. Specialist retailers such as music musical instrument shops, fashionable boutiques and hairdressers live in these Arcades. For a traditional shopping experience you could visit Cardiff's Central Market which is on St. Mary Street. Look and choose from fresh produce on display at traditional grocers stalls. Butchers display expertly cut and prepared meats. Try some laver bread, welsh seafood delicacy at Ashtons the fishmongers. Five minutes walk away, at the end of St Mary Street is the Brewery Quarter. A vibrant new development where there are numerous bars. Restaurants serving food from Asian cuisine to Spanish Tapas. Near here are many of the city's hottest nightspots. Bus Routes Just about all the bus routes pass by here. The Central Bus Station is about 5 minutes away and Castle where other routes stop. A new development of one bed flat or apartment ideally suited for an executive or professionals wanting to be in the cetre of city life. Fully double glazed with electric heating. Wood flooring in hall and lounge giving a clean modern feel which is easy clean. Bathroom and kitchen have slate tiles. Balcony with roof top view. Fully fitted kitchen, Fridge and freezer shelf, washer dryer machine, electric hob and oven. Entrance intercom. Smoke detectors and fire alarms. Protect yourself against losses through theft or accidental damages with Tenant Insurance. Receive an on-line quote from Endsleigh to see how much you can save on a wide range on insurance cover including Tenant Contents, Car, Travel and Bike Insurance.